Older cities like Louisville offer opportunities for redevelopment within the core of the city as opposed to sites along the perimeters. At times, these sites are located in economically depressed areas of the city. A decade ago, a single project constructed on east Market Street provided a genesis for ongoing development. Today, Market Street is one of the city’s most vibrant neighborhoods with businesses that flourish, created jobs, new residents and more. In 2016, Passport made the bold and innovative decision to locate new offices upon the old Phillip Morris site in west Louisville. The 20 acre site had been vacant for decades contributing to urban decay along its perimeters. Passport was able to acquire the site for a fraction of the average for properties located within the urban core. City leaders and residents celebrate this strategic move that assures economic reformation for this distressed area of town while improving the built environment for all residents of Louisville. 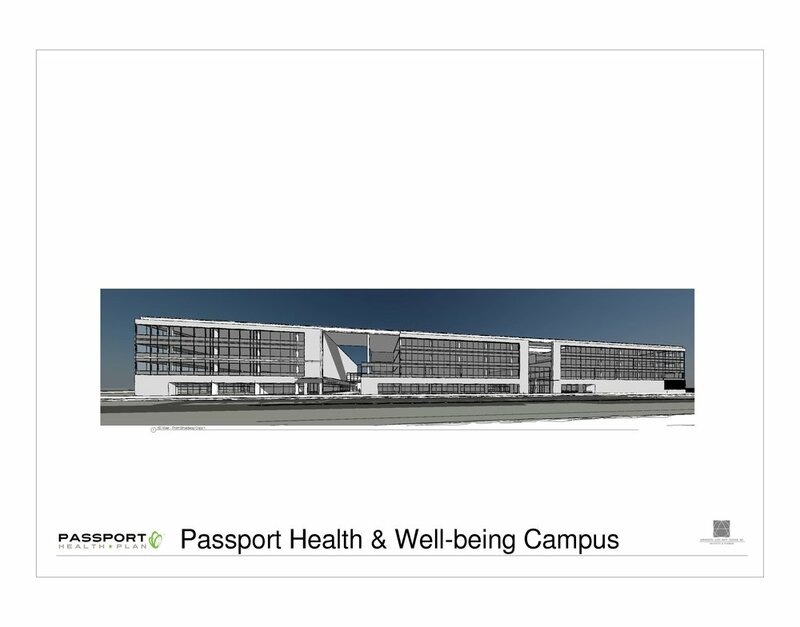 Passport challenged the designers to create a Health and Wellness Campus to compliment the building. 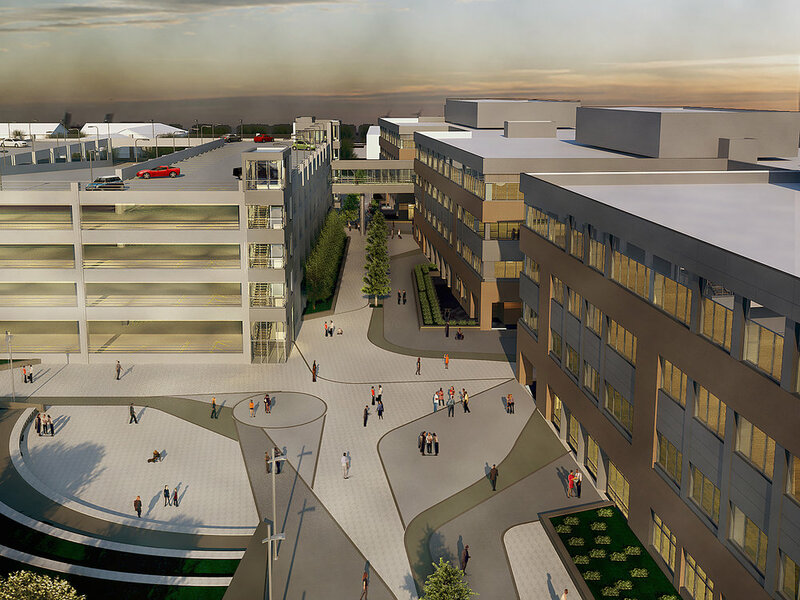 An extensive park like plaza links the Passport Building and the future buildings of Phase 2. Development of Phase 2 will be funded by others who desire to acquire out parcels for various interest. Phase 2 development will include workplaces, healthcare, food service, retail and multifamily residential. Once complete, it is estimated that nearly 5000 persons may visit the 20 acre site each day. The Passport Health and Wellness Campus is an outstanding example of new urban revitalization and will likely serve as a model for others nationwide. This once impoverished property has already garnered Phase 2 commitments from area Developers and has encourage new development nearby. New construction is underway to the east along the Broadway corridor. Real jobs are created, property values are on the rise and renewed interest in the area is mobilizing. All of this is possible because a single corporate partner was willing to take the first step. The result is a new built environment that we can all enjoy while creating wealth for investors and new revenue streams for the City of Louisville and the Commonwealth of Kentucky. Construction on the new Coffee Crossing location in Sellersburg, Indiana is under way and is expected to be finished in February. The new location will have an outdoor seating area with a fire pit that will be perfect for coffee gatherings. Below is an AJRC architectural rendering and a photograph of the current construction. A former Kmart building, vacant since 2016, was recently purchased by the Jeffersonville-based development company arc and converted into an an indoor conditioned storage facility by AJRC. Alan Muncy, president and CEO of arc, expressed that he wanted to make sure that the facility would be repurposed in a way that would benefit the area, noting the lack of climate-controlled indoor storage in Southern Indiana. The 78,000-SF storage facility, located at 3525 Grant Line Road in new Albany, Indiana, consists of 550 units ranging from 3 x 3 feet to 15 x 20 feet. 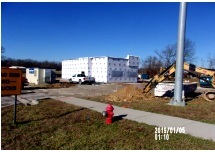 To learn more about the arc Storage facility in New Albany, click here. The 3-floor, 12-apartment/retail space Lofts on Hancock building is under construction. AJRC recently converted the former Holy Family grade school into a modern office building for the Roman Catholic Archdiocese of Louisville. Over 30,000 SF of classrooms and cafeteria were replaced with private offices and a conference center. An additional 8,000-SF wing was constructed for administration offices and a public lobby that will also function as event space. The existing building underwent extensive asbestos abatement and demolition to prepare for its new purpose. The exterior walls and original roofs were upgraded with foam insulation. All windows were replaced with double-pane, low-E storefront. All mechanical systems and fixtures were replaced with new equipment, such as LED light fixtures and photo-voltaic solar panels on the roof. The addition complements the original school with matching red brick and limestone while introducing glass curtain-wall and metal panels to provide a modern refresh to the campus appearance. The Archdiocese of Louisville is now leading the way in clean, renewable energy in the area along with its new partner, the Louisville Gas and Electric Company. The partnership, called Business Solar, now operates the first diocesan-based solar array in Kentucky. 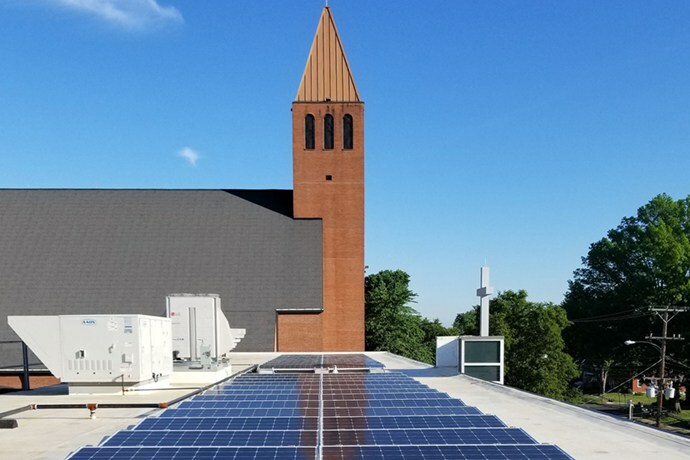 The array, which is located at the Archdiocese's Pastoral Center and Headquarters at 39040 Poplar Level Road, will play a significant role in keeping Louisville green as well as saving the archdiocese money on energy. The archdiocese's solar array, built and installed by LG&E, is a rooftop-mounted system consisting of 100 solar panels. The solar facility was built to maximize the space and resources available. The system is expected to produce 30 kilowatts of power per year, which is more than enough energy to power four typical residential homes for one year. Archbishop Joseph E. Kurtz, a strong advocate for clean, renewable energy, has cited Pope Francis, calling on everyone — "churches, businesses, the civic community, neighborhoods, and individuals" — to have a shared responsibility in caring for others and the environment. To learn more about the Archdiocese of Louisville's solar panel array, click here. Momentum is building in Bowling Green for the future Aviation Heritage Park Museum. Watch this broadcast to see how things are progressing and check out the fine AJRC rendering and animation work by J.M. and Kip. We look forward to completing the next phase of this exciting project! You can help with the fundraising efforts by calling the Aviation Heritage Park at 270-421-4885, or visit aviationheritagepark.com. A 19-acre site located along the historic West Louisville Broadway corridor will become home to the new Passport Health Plan Headquarters. The project to develop the campus will be designed and constructed in two phases. Phase 1 will develop the new headquarters while Phase 2 will develop out parcels. The Phase 1 Development Plan was approved through Metro Louisville agencies in early August and design is now moving forward for construction with occupancy expected in early 2020. Passport Health Plans enthusiasm for relocating in West Louisville with the new YMCA and the Russell neighborhood redevelopment nearby has set in motion a renaissance for the entire area. These improvements to the built environment along the with Brown-Formans' long standing commitment secures a sound future for the Russell, California, and other West Louisville neighborhoods. The attached preliminary elevation study provides early insight into the scale and use of material. AJRC Inc. Hires Two New Employees! Arrasmith, Judd, Rapp, Chovan wants to welcome two new employees, Amber Bowman and Sam Goodwin to the team. Amber is our new interior designer. She graduated from the University of Kentucky College of Design where she received her Bachelors of Arts in Interior Design. From there, she spent some time working at a design firm in Cincinnati, OH before moving back to Kentucky and joining AJRC in March of 2017. Amber has had a passion for architecture and design since middle school where she would draw blueprints during her math class. She credits the computer game "The Sims" for her interest in design/architecture. Sam is our new intern architect from Jackson, Mississippi. Sam graduated with a Bachelors of Architecture from Mississippi State University. Sam's interest in architecture grew quickly when she discovered pre-pharmacy wasn't what she wanted to do. She wanted something different. Before joining AJRC in May of 2017, she worked for a non-profit who designed small scale projects in small towns across Mississippi. 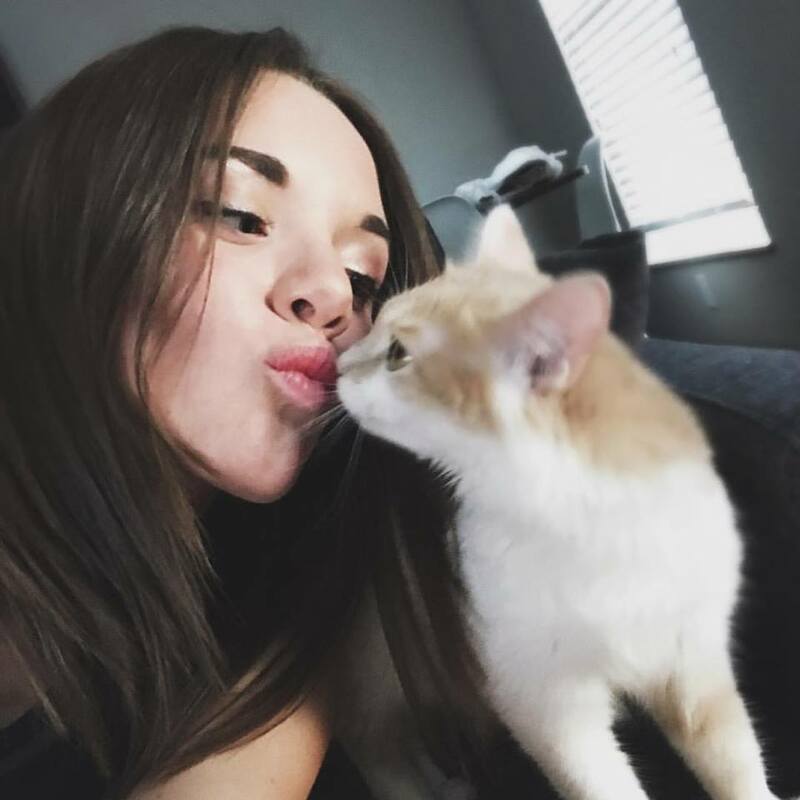 Amber with her cat Piper! 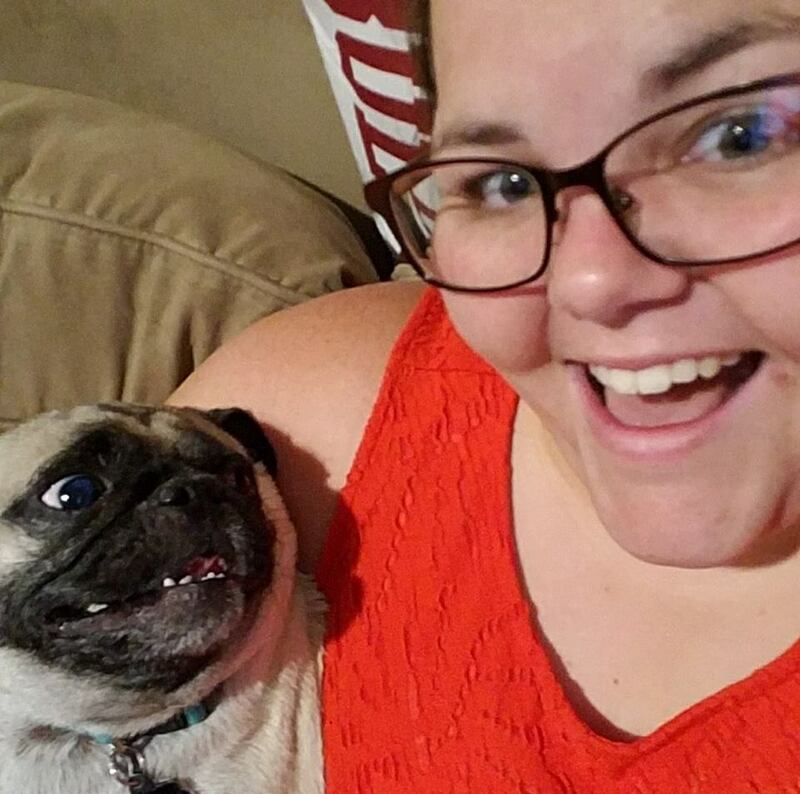 Sam with her dog Barry! PHP announced in April 2017 their plans to construct a new headquarters in west Louisville. The project is expected to transform the long neglected West Broadway corridor. Upon selecting Arrasmith, Judd, Rapp, Chovan, programming began in earnest to define space need and develop preliminary images. Development Plans were submitted in July and are pending approval. Upon approval, our firm will continue work to issue a site package in the fall of 2017. Multi bid packages will continue into 2018. PHP will occupy the new headquarters in early 2018. 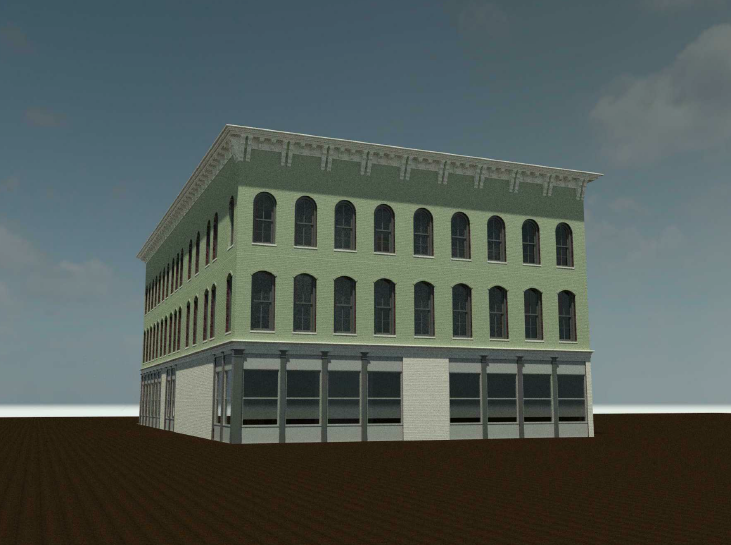 Stay tuned for updates on our progress towards completion of this most important and exciting new project for PHP and the Louisville community. Arrasmith, Judd, Rapp, Chovan, Inc. of Louisville, Kentucky has been working with the Imran Khan Cancer Appeal (IKCA) to design cancer hospitals for Shaukat Khanum Memorial Cancer Hospital and Research Centre's in Pakistan. AJRC has provided design for several impatient and outpatient facilities. In the late 1980's, Imran Kahn launched fundraising efforts to commission and build cancer hospitals to serve his fellow Pakistan citizens. In 1994, the construction of the original facility in Lahore was completed under guidance of Naushewan Burki, MD, who was a member of the medical staff at the University of Kentucky. Since then, SKMCHRC has served over 250,000 patients annually with 75 percent of those patients receiving financial assistance. In 2012, the IKCA launched the design of the second facility to be constructed in Peshawar. Phase one, supporting outpatient care, opened in 2014. Phase twom supporting impatient care and research, is nearly complete and expected to open in late 2017. IKCA recently launched design of the third facility to be constructed in Karachi. Schematic design is in process with site-related construction expected to start in late 2017. AJRC is also current;y working on design for a large addition to the original Lahore facility. Combined, the three cancer research and treatment hospitals located in the populated regions of Lahore. Peshawar and Karachi will provide cancer care to nearly 1,000,000 patients each year. AJRC's role is that of design architect charged with programming and providing design development documents to the Architects of Record for each of the three new facilities. Building science varies from the practices that architects and engineers subscribe to throughout this region. Materials are limited and construction equiptment can be difficult to mobilize especially in remote Peshawar. For example, exterior building materials were limited to concrete and masonry as modern wall systems are far too expensive to deliver given limited access. AJRC were the architects for many Louisville healthcare projects, such as the Cardiovascular Innovation Institute, which won a MediStar Award for Design in 2013, the Health Frazier Rehab Center as well as Park Tower at Baptist East. Healthy House is now open for business in Louisville's west end. This building is the new headquarters for Louisville Grows, an organization that assists community groups and individuals to achieve sustainability goals such as community gardens and tree canopy restoration projects. The Healthy House also features an art gallery, event & conference space, classrooms, and a commercial kitchen for cooking classes. Read more about the grand opening and the new cooking programs being offered at Healthy House. The new 280-bed skilled nursing facility in Milledgeville, Georgia will house aging and infirmed former prison system inmates who have served their terms, but who now will require healthcare treatment or supervision. Read more about this groundbreaking concept of serving the healthcare needs of aging former prison inmates in Georgia. Or watch this news story! Arrasmith, Judd, Rapp Chovan is privileged to serve the Shaukat Khanum Memorial Cancer Hospital and Research Centre with design and construction of the new facility currently under construction in Peshawar, Pakistan. The state of the art facility is designed to US standards providing an environment of care on par with the best facilities in operation around the globe. The Phase 1 Out Patient Services opened to the public in December of 2015 while work to complete the Phase 2 Inpatient and Research is ongoing. Plans are now underway for a similar facility in Karachi, Pakistan. In 2015, the original SKMCH &RC in Lahore admitted nearly 12,000 patients while over 200,000 visited the Out-Patient. SKMCH &RC is Pakistan’s largest and most prominent cancer treatment facility providing diagnostics and treatment to the Pakistan population. Many patients do not have the means to pay for treatment while others pay what they can. Today, about 75% of the patients receive financial assistance. Accordingly, SKMCH &RC relies on the contributions of many to support day to day operations. To date, ongoing efforts have raised 61% of the budget required to support operations for the year 2016 with approximately 50% of these funds raised through donations. SKMCH &RC was conceived of and built by Mr. Imran Khan, who in the 1980’s led the Pakistan Cricket Team to the World Championship. His vision to make cancer treatment accessible to every citizen of Pakistan received an infusion of excitement through his fame but its ability to sustain itself for over 20 years is the result of his tireless efforts as Chairman of the Board. AJRC and CLR Design have teamed up to create the new Snow Leopard Exhibit at the Louisville Zoo. The exhibit features the snow leopards in their natural habitat, the Himalayas. The stimulating exhibit will encourage the animals to jump from rock to rock. Guests will experience the leopards' ability to jump up to six times their body length, making them the biggest jumper of the cats family. This exhibit, along with an Education Program Space, will be open in 2018. It was recently announced that The Louisville Boat Club will host a brand new professional tennis event, The Louisville International Open. This event, scheduled to be held annually, will be held on the grounds of the club. The team of AJRC & Realm Construction are providing renovations that will help to support this tournament as well as year round activities. Phase One will see upgrades to the fitness facilities, including areas for spinning & yoga classes and also a gym area furnished with new state-of-the-art exercise & training equipment. Phase 2 will substantially reconfigure the Pool Pavilion by changing the old snack bar and multi-purpose room into a brand new restaurant complete with a commercial kitchen and indoor/outdoor dining areas overlooking the tennis courts and pool.